Neste jogo que é a vida, seja ela sozinhos, com alguém que amamos, não apenas por paixão, mas também em relações de amizade, achamos que apostamos em pessoas, que apostamos o que podemos ser e, muitas vezes, tal como num jogo the slot machines, apostamos pouco com a esperança de sairmos a ganhar milhões. Afinal, há um certo nervosismo miudínho que nos faz acreditar nessa probabilidade. Foi exatamente isto que aconteceu ao alemão Fritzt Kalkbrenner, conseguiu um feito único, juntamente com os seu irmão Paul Kalkbrener. Ambos tiveram o seu primeiro breakthrough com o tema incluído no filme Berlin Calling denominado Sky & Sand (incluída na Playlist do Blog) que esteve 129 semanas dentro da German singles charts.Tal como em todos os caminhos que temos que seguir no nosso dia a dia, após esse sucesso, ambos seguiram direcções artísticas diferentes, embora ambos dentro do género electrónico. Fritz, tem vindo a proporcionar umas tantas alegrias electrónicas desde o seu primeiro álbum Here Today Gone Tomorrow (2010), oferecendo melodias mais quentes, com alma e repletas de batidas electro q.b. Em 2016 editou Grand Départ e cujo single In This Game, nos faz questionar até que ponto somos capazes de mudar o que somos neste jogo que pode ser uma relação a dois. Por vezes, nos altos e baixos de relações saturadas a frase Desire to find a chance to change who we’ve become é mais que perfeita, mas apenas desejar não chega, e todos nós sabemos isso. É aqui que entra o refrão, que resume qualquer jogador, que ganha, perde, roda e sangra, que mais não é que dizer-nos que todo o sucesso só depende do que pretendes atingir ou, se não te queres magoar, não precisas de jogar (mas também não irás ganhar nada!). Este é, então, o tema para a página de segunda-feira, oriundo das terras frias da Alemanha, mas que se vai enquadrar nos teus dias de sol, quentes e apaixonantes. In this game that is life, with someone we love, not only for passion, but also in relationships of friendship, we think that we bet on people, that we bet what we are, often, like in a slot machines game, we bet little, hopping that we will make millions. After all, there is a certain nervousness that makes us believe in this probability. That is exactly what happened to Fritzt Kalkbrenner, achieved a unique feat, along with his brother Paul Kalkbrener. Both had their first breakthrough with the song included in the Berlin Calling film called Sky & Sand (included in the Blog Playlist) which was 129 weeks within the Germany singles charts. As all the paths we have to follow daily, after this success, the two followed different artistic directions, both within the electronic genre. Fritz has been offering some electronic joys since his first album Here Today Gone Tomorrow (2010), providing warmer, soulful melodies and full of electro beats, from which the single In this Game questions us on which extent are we ready to change who we are in this game that a relationship is. Sometimes in the ups and downs of saturated relationships the sentence Desire to find a chance to change who we’ve become is more than perfect, but wishing is not enough and we all know that. This is where the refrain comes in, which picks up any player who wins, loses, runs and bleeds, which is not more than telling us that success depends on what you want to achieve, you do not need to play (but you will not win either anything!). This is then the theme for Monday's page, coming from the cold lands of Germany, but that is going to fit in your hot, sunny and captivating days. 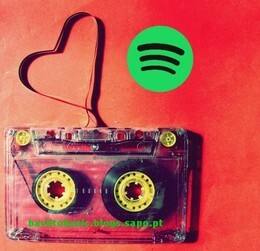 ... Apaixona-te pela Playlist do blog Back to Music, Love & Lifestyle! Podes ler e ver a selecção de música e videos no blog, seguir no Twitter ou Facebook e as fotos no Instagram. 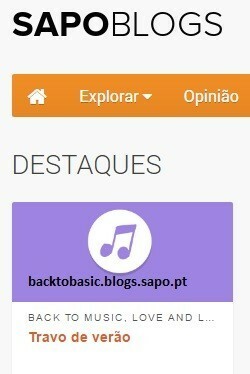 Para além disso, tens agora a oportunidade de ouvir a selecção musical do blog no Spotify! Esta é a melhor forma de escreveres os capítulos da tua vida, ter prazer ao viajar para o trabalho, relaxar após aquele dia longo ou simplesmente agarrar uma garrafa de gin e desfrutar antes de ires sair. Prepara-te para uma playlist que vai te acompanhar nos dias frios com chillout e downtempo, sorrir contigo depois de beberes umas caipirinhas, com house e electrónica e fazer-te recordar aquelas fotografias que tens escondidas com algum revivalismo das décadas de 80, 90 e 00. Nas últimas duas semanas, compilámos faixas de Robyn, Delicado, Alex S, Rui da Silva, Sannie, 2raumwohnung e aquele que foi o post mais visitado mês, Bob Sinclair. 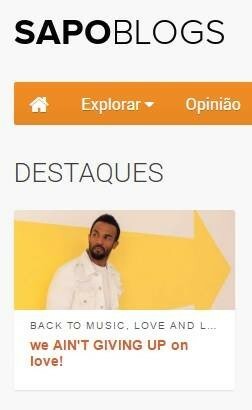 A estas, adicionamos algumas lembranças com temas que vão estar no evento Love The 90s, em versões mais uptodate de We Are Legends e classic house por Stonebridge. Assim, temos um total de 10 faixas às quais novidades se irão juntar semanalmente. ... Fall in love with the Playlist from the blog Back Music, Love & Lifestyle! You can read and listen the track selection and videos on the blog, follow on Twitter or Facebook and photos on Instagram. In addition, you now have the opportunity to listen to music selection from the blog on Spotify! This is the best way for you to write the chapters of your life, enjoy commuting to work, relax after that long day or just grab a bottle of gin and have fun before you go out. Get ready for a playlist that accompanies your cold days with chillout and downtempo, smile with you after drinking some caipirinhas, with house and electronica and make you remember those photos you have hidden with some revivalism from the 80s, 90s and 00s. Over the past two weeks, we gathered tracks by Robyn, Delicado, Alex S, Sannie, 2raumwohnung and the one that was the most visited post of the month, Bob Sinclair. To these tracks, we added some memories with songs that will be featured on the event Love The 90s, in a more uptodate version by We Are Legends and classic house by Stonebridge. So we have a total of 10 tracks with some new ones to be added weekly. chilltronica with Blank & Jones! Pieter Blank and Jaspa Jones, mais conhecidos por Blank & Jones, são um dos maiores nomes da música electrónica alemã. Apesar das suas produções serem maioritariamente voltadas para o trance/electro, conseguem cativar outros fans ao editarem 3 cd’s denominados Relax, com influências downtempo e chillout. Provando que não se limitam a um género apenas, para quem admira aqueles momentos introspectivos, os Blank & Jones apresentam Chilltronica, um novo conceito de chillout numa compilação com nomes sonantes como Erlend Oye, Depeche Mode, Bliss e Lulu Rouge. Se depois do Verão os sons baleares de guitarras acústicas e músicas frescas se tornam um tanto ao quanto fora do contexto, Chilltronica apresenta melodias mais escuras e melancólicas. Desta forma, este cd pode muito bem ser descrito numa frase apenas: a perfeita “late night music for (our) cold winter days”. Por isso, para sentir o Inverno em todo o seu esplendor…ouve! Pieter Blank and Jaspa Jones, known as Blank & Jones, are one of the biggest names of German electronic music. Although their productions are mainly trance/electro, they can also capture other fans by releasing 3 cd’s named Relax, with downtempo and chillout influences. Proving that they aren’t stick to just one genre and for those listeners who admire more introspective moments, Blank & Jones present Chilltronica, a new concept of chillout in a compilation containing big names such as Erlend Oye, Depeche Mode, Bliss and Lulu Rouge. If after the Summer the balearic sounds and fresh songs are completely out of context, Chilltronica presents more dark and melancholic melodies. As a result, this can be just said in a simple sentence: the perfect “late night music for (our) cold winter days”. Therefore, in order to feel the Winter in its splendour…listen! i'm in a great chillout mood!